I bought a Scottish broadsword from an antique shop that I'm cleaning up. It's missing the fabric inside the hand guard and the tassel. I'm going to replace them and was wondering if there were any specifics about replacing them? For the hand guard I saw things ranging from just a piece of felt to leather lined with red fabric. I was wondering what is traditional. I also saw a variety of those and again wondering what's traditional. Finally I'm looking for some history on it. It's a wall hanger, nothing you'd take into battle. The only marking I've found is "India" stamped into the blade. So I'm wondering if there were specific companies from India that made/make broadswords and how old it could be? Also I imagine swords for ceremonial military use might be wall hangers so any possibility of that (India was part of the British empire so I thought it wouldn't be too outlandish for the Indians to be making swords for the brits). Any info would help! Thanks in advance! Cannot really see the sword very well from your photo. However, I can assure you that swords like this, for Scottish regiments, were not made in India. 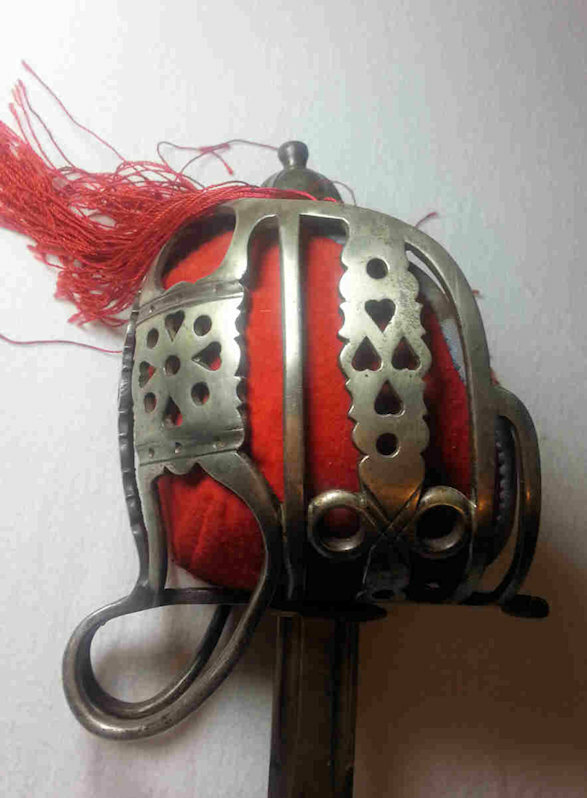 The basket, while it resembles the Pattern 1828 sword, is definitely not regulation. I suspect you have a modern made sword. These swords are sold by the thousands in the US and elsewhere and sold for as little as $30. They are not well-made, usually have the metal scabbard with rings for carrying, and the baskets may be coated with lacquer to prevent tarnishing of the basket. The blades show no sign of sharpening and are very thick on the edges. The fullers are poorly defined. The blade on yours, what I can see of it, does look a bit different from the run of the mill Indian made basket hilt but it is only possible to tell with a better view. But, I did not answer your question, re: the basket liner. 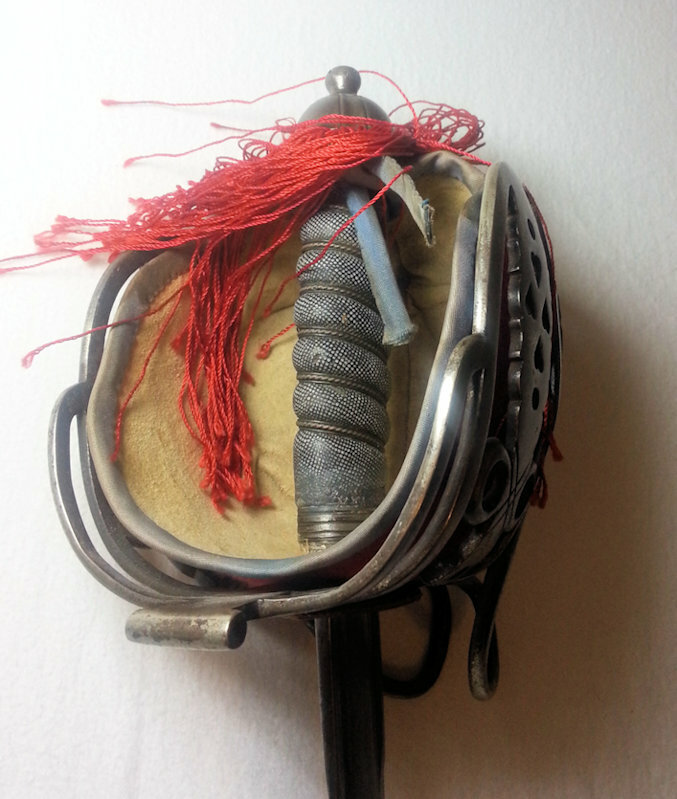 In the case of Indian swords of this type the liner is red cloth, some sort of felt usually. The cloth is held in place with a wire frame. You can probably make a frame out of thin brass wire or even steel wire, if it is flexible enough to be shaped to fit the the basket. I would say to unscrew the pommel at your own risk. The threads on the tangs of these swords are not good and the steel itself is of poor quality. They are easily stripped and/or cross threaded. I have never seen one of these that was made in Pakistan but have handled hundreds of them from India. There are minor variations in the baskets, pommels and in the blades, but overall the pattern is the same. Nearly all of them are missing the down swept back guards which are one of the most obvious characteristics of Scottish basket hilts. I think to be strictly traditional the liner should be white doeskin covered on thre outer side with red felt.and edjed with blue satin ribbon. The shoullso be a fringe (wig) of srands of red silk. This one has a replacement cotton wig and the blue satin has faded to grey it should really be a bright sky blue. The only marking I've found is "India" stamped into the blade. that, unfortunately, is pretty good evidence that its about as much of an antique as I am. Well, how old are you then? Yes there are some fairly decent Indian-made swords, mostly from Cold Steel. What Jonas has appears to be one of those thousands of swords, made in small workshops throughout India and distributed around the world at bargain basement prices. 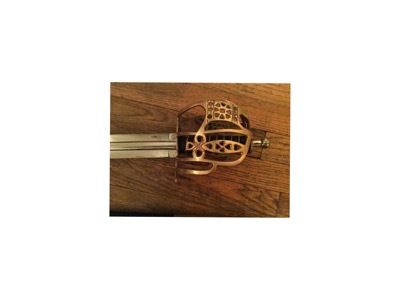 Deepeeka makes or made a basket hilt similar to your description and that may be what you have. I have handled a few of those too and, while they are a cut or two above what Jonas apparently has, they have their flaws as well.